I’ve never played a pen and paper RPG in my life, but I have played plenty of computer role playing games. Two people in our group had played the original Pathfinder RPG series, so the opinions below are a mix of experienced and inexperienced RPG players. Also, we’re reviewing the Pathfinder Adventure Card Games as a whole so you can get a feel for how all of the base games and their expansions work. 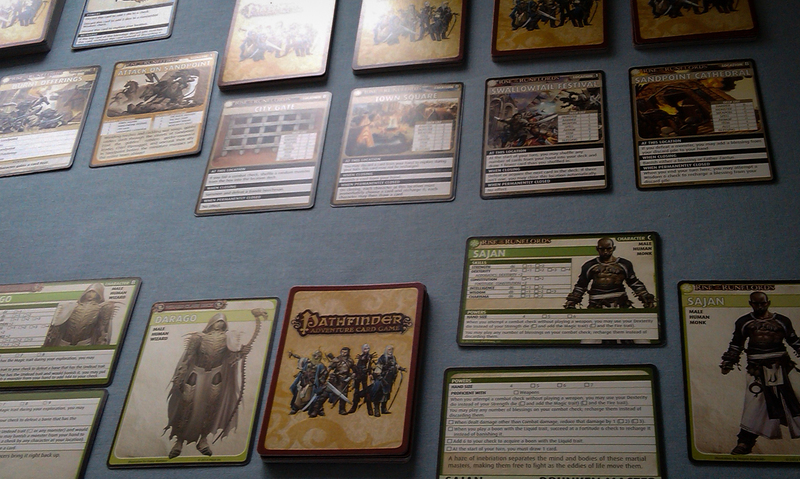 What is Pathfinder Adventure Card Game? In Pathfinder Adventure Card Game, you and your fellow adventurers will be going through a number of scenarios trying to defeat bosses and upgrade your characters’ abilities and gear. This is a highly expandable campaign game, so there are plenty of adventures to go on and a ton of different cards to add to your decks. You will probably look at all of the cards and all of the information on those cards and think that Pathfinder Adventure Card Game is a very complex game. Well, it really isn’t. After you learn what each of the keywords mean, it’s really just a game of flipping cards, reading those cards, and rolling dice. Throughout the game, you will be making skill checks. Again, it sounds confusing if you’ve never played a D&D-style RPG, but it’s really not. All that means is that you are rolling dice and seeing if you failed or succeeded. You make skill checks throughout the game both for fighting and acquiring new cards. Each player will have his or her own character, which means that they will have their own sets of attributes and special abilities. When you’re playing the game, you will roll certain dice (d4, d6, d10, etc.) based on your abilities and the cards that you have in your hand. For example, you could use a weapon to make your attack better by rolling an extra die during your skill check. So, how does the game work? Well, you will have a specific number of locations depending on the scenario that you’re playing and the number of players. You will search through those locations for enemies, weapons, allies, and other goodies. You will roll dice to try to defeat enemies or gain other cards. You can help other players by sharing cards and/or helping them during skill checks. If you’re playing the game as a one-off, you’re simply trying to defeat the villain in the scenario that you’re playing. If you’re playing the campaign, then you will slowly go through the adventure, trying to defeat each scenario’s villains and upgrading your arsenal and abilities. To me, this is the closest you can get to playing an online role playing game in card game form. The weapons, the allies, the campaigns, the upgrades… it all adds up to a solid video game-style RPG experience. It’s odd that some people don’t like the artwork in this game because my group absolutely love its. Yes, the white backgrounds on the cards are plain, but it also helps to make the characters and items stand out. Being able to play with up to five other people is pretty great. So many games max out at four players these days, so it’s nice to have a solid co-op that I can break out with larger crowds. There’s actually quite a bit of replay value in both of the base games’ boxes. You can even start new campaigns with new sets of characters and still have a complete experience. I also like that the rules are straightforward enough that even beginners can get into it pretty quickly. You will need 10 or so minutes to get used to the turn structure and some of the keywords, but after that it is pretty much smooth sailing. The only semi-big problem that we ran into on multiple occasions was forgetting an extra rule or two while playing certain scenarios. For example, it is very easy to forget to roll a die after you successfully beat a monster since the rule isn’t right there in your face. You can get so focused in on the skill checks and making sure you’re rolling all of the correct dice that you forget some other little rule. It’s a bit frustrating when you realize you forgot to do something a few moves ago, but that happens in a lot of these types of games. It definitely doesn’t ruin the experience. Also, the early scenarios are a bit too easy. 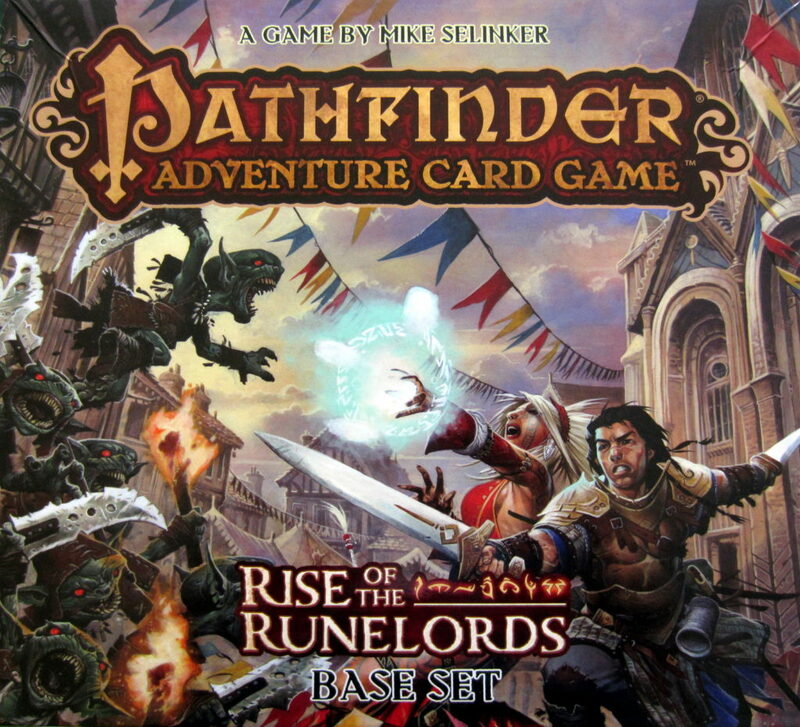 Pathfinder Adventure Card Game is one of the better cooperative role playing games that we’ve played. This game was made for board gamers who love to play solo or have a gaming group that is willing to stick with their characters for many hours of role playing fun. Just don’t expect it to play out like a classic tabletop RPG because it’s just not that type of game. If you do end up liking either or both of the base games, you’ll definitely want to check out the Pathfinder Adventure Card Game expansions. You can also test out the game by downloading the Pathfinder app on iOS or Android. Thanks for taking the time to read our Pathfinder Adventure Card Game review!